TIS-3D is a Minecraft mod inspired by the brilliant game TIS-100 (buy it, seriously). 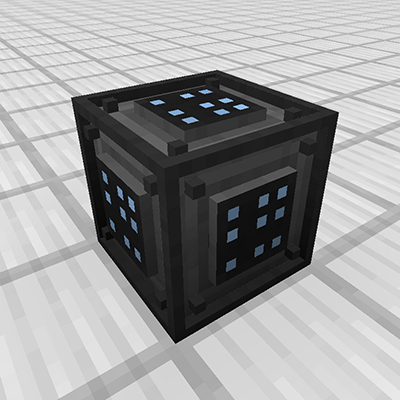 It takes the concept of minimal, programmable nodes (called "modules" in the mod) and expands it to the third dimension. This allows building multi-block computers from different modules in a super-flexible manner. Some generally useful modules include the executable module, which can be programmed in an ASM dialect (as introduced by TIS-100 but with a few more quality-of-life instructions), and the redstone module, which allows reading and writing redstone signals, enabling basic interaction with the world. More specialized modules include the stack module, providing a small data storage, the infrared module, allowing for wireless transmission of data between TIS-3D computers, and the terminal module, providing rudimentary text in- and output. And there's plenty more. To get started, craft a controller and a few casings. For looking up recipes I strongly recommend grabbing JEI. To get a copy of the in-game manual, use a book on a placed controller (i.e. right click the block with vanilla book in hand). You should find all further information you require in the manual. To program a TIS-3D computer, you can either use a vanilla Book & Quill or the TIS-3D Code Bible. To install a program from one of the two onto an execution module, simply use the book on the installed module (i.e. right-click it while holding the book in hand). When using the Book & Quill, each book will be treated as one long program, i.e. all pages will be concatenated when the program is installed on an execution module. When using the Code Bible, each page is treated as an individual program, and the program on the currently selected page will be installed on the module. You can also copy programs from execution modules back into the Code Bible by using it on an execution module while sneaking. So what do you actually do with the mod? Have fun with it! Use it as a means of automating things you'd otherwise automate using complicated redstone circuitry. Create a music machine. Design a machine-code interpreter and run even larger programs (programmed into a ROM module). Go nuts! Anyway. Here's a short video explaining some of the basics if you don't like reading. It's from an early development stage, but the core concepts still apply. @Sangar Hello, what 1.14 snapshot, Fabric API and Fabric Modloader versions were used with your 1.14 release. Just curious. Thanks. Ah yes, should have added that to the changelog! 1.5.0.1 (for 1.14) was built against Minecraft 19w03c and Fabric 0.1.4.78.
is there anyway you can get the machines to use RF or energy in general? i can't run this mod, is crashing my game on the start! Did you try using Rift Modloader? True 1.13 tagged Mods Use Rift, until 1.13 Forge comes around. Unless a mod like Inventory Sorter for 1.13 uses a dev Forge build of course. But 1.13 Forge isn't public yet. So Rift is the only way to go for modding environments publicly right now. Can you make some other way to input code to module? Using book for this is uncomfortable. Have you tried using the "Code Bible"? I am not a code expert, this is Assemble? Also there it's strong differences apart the language from other mods like Opencomputers (lua) or Retrocomputers than uses Forth? I don't see how typing in a GUI of a block would be any different from typing in a GUI of an item, honestly. Plus IMHO the Code Bible is pretty advanced as it even has syntax error highlighting and such. As the description says, the language is from the game TIS-100. It's a very small language, similar in concept to ASM. The main differences to TIS-100's language are that there's just a couple more convenience instructions. See the ingame manual's page of the execution module for more info. Hey, I'm introducing myself to the programming world. Would you help me to find useful documentation so I can start playing with your mods OC and TIS to learn easily? I would like to see some examples of code to learn how to make the components interact with themselves. I have a bit of experience with C but the only thing I've been able to do is a .lua program to ask for a password and then open a door and close it with redstone. I want to know how to use wireless connections and such things. By the way thanks for your work it's amazing to see things like this. And other little question: wich Minecraft version will guarantee compatibility with most mods including OC, Computronics, CC and others related to building and logics? For OC, well, there's also the ingame manual, which should cover pretty much anything gameplay relevant. For API documenation and such, check out OC's somewhat-outdated-but-maybe-not-terribly-so wiki. Finally, #oc on esper.net (IRC) is a good place to get help with OC. As for the most compatible/stable version... 1.10 is kinda fine-ish I'd say, 1.7.10 is probably the most proven and stable version, 1.11 is pretty unstable/unfinished still. I haven't used this before, but something I think would be very useful is a Deque module. My thinking is for something like a snake game you would have to push movement positions, then pop them off to reset the end of the snake on the screen. If this is easily implemented using existing components I'd be interested to hear. Maybe using RAM and having the indices loop around. Hmm, how to select the end to push to/pop from tho. Using sidedness would set a precedent I'm not sure I want (actually I'm pretty sure I don't want :P), and using a protocol would make it too clunky to differentiate it much from RAM. As there's a FILO structure with the stack module already, it might be a compromise to add a FIFO one (buffer module? queue module?) and then use a mix of those for any particular usecase. Yeah, a buffer module sounds good. It'll be rare that you'll want to do both, and if so you could probably just roll your own solution with RAM. I opened an issue on Github as a reminder. After working non-stop for an hour of two, I got my first project working! It's a basic program that prints out a grid of increasing colors. I'm not exactly an expert at coding, and even less so at assembly, so I used this to get me used to jump calls and 1D array to 2D array conversion. I understand I could combine COLORS and COORDS to minimize Execution Panel usage, I just kept them separate as they have very different roles. The difference between COORDS and COORDS2D is that COORDS creates numbers 0 to 255 and outputs them, whilst COORDS2D converts them into a point on a grid 15 tiles wide. I chose 15 tiles so that there could be a diagonal color effect, though it can be changed just by modifying 15 to the number you want and each 14 to said number minus 1. As for changing the 15s and 16 in Colors, don't. Unless you want to lower the color palette, it has no other use, it's just for letting colors repeat. I noticed that with the current execution speed, it takes a long time for my program to get past the first 15 draw calls, far longer than I'm used to. As I see it currently I will only be able to make programs that use flat colors, as using very much texturing would take too long. While using four execution panels all funneling draw calls into the display would speed things up, it seems like a lot of timing work to get it set up. I don't know if this was an intended limitation to make programmers use four panel draw calls, but if not could you add a config option to speed up or slow down execution? If I may be so bold an in game gamerule or even a module that goes on the controller would be even better, just so we can pick and choose which of our setups would run at which speeds. Either way this is an amazing mod, thank you so much for making this. I never knew I needed this!